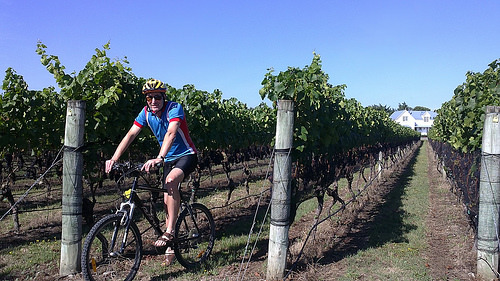 One of life’s pleasures is biking through boutique vineyards under a blue summer sky in the heart of Martinborough. 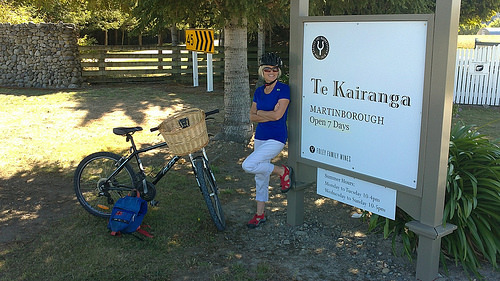 Being located a mere hour’s drive from Wellington, Martinborough provides an alternative base for travellers and the more relaxed lifestyle of a small town. 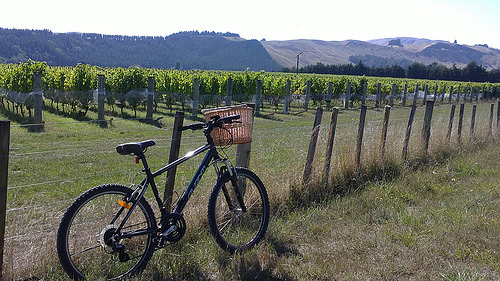 People usually bike around the vineyards in the afternoon when most of the vineyards will be open. But we’re early birds and the day’s going to be hot so off we go. 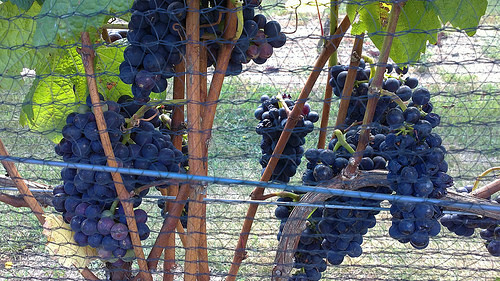 The vines are at their most beautiful, dripping with plump grapes. 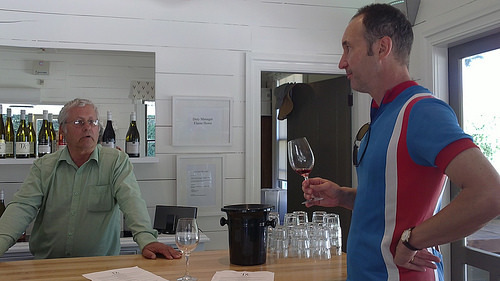 Every vineyard cellar door should have have someone like Paul to work in their tasting rooms. 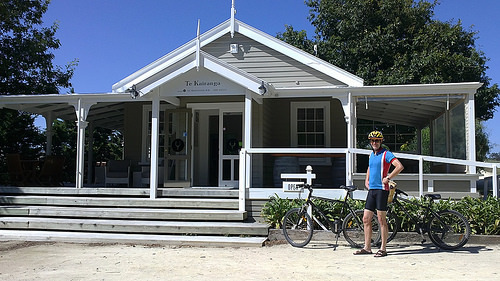 There are six of us in the tasting room at the Te Kairanga Vineyard Cellar Door. Paul’s time is being monopolised by a couple of elderly women wanting to discuss the sunflowers growing in the next paddock. The rest of us couldn’t give a toss about the damned sunflowers. Good old Paul, showing great tact and diplomacy, brings us back to the subject at hand, WINE! Paul feels that people misunderstand wine and food matching, especially the young who view wine as a drink you guzzle until you fall flat on face – because it’s only then that you know you’ve had a really good time. Of course it’s easy for someone of my vintage to forget the level of sophistication it took to drink wine called ‘Black Tower’ and ‘Blue Nun’. And who could forget ‘Liebestraum’ presented in a plastic bladder and packaged in a nicely decorated cardboard box. Yep, but some of the simpler things in life should always remain the same. wow – I want to go now! Definitely putting that on my list of places to visit and things to do when we head to Wellington. Have often thought about it so reading your blog and seeing your wonderful photos has just made it all the more urgent to do soon! Great place to relax Jan and if you are out that way,can definitely recommend Poppies for a fabulous vineyard lunch platter for two.